After a bit of a diaper reviewing hiatus, I am so glad to be back reviewing some more fluff for your reading (& shopping!) pleasure! :) This time, I am very pleased to be reviewing a product from another fabulous, home grown Canadian company, Comfy Rumps! Based out of Vancouver, this family-run business is owned and operated by married couple, Christie and Trey, who are passionate about providing sustainable alternatives to disposables. Their business, like so many others in the industry, started out when they begin having inklings about just how much cloth diapering had changed their family's life with their son (born in 2008). They themselves went through a variety of diapering systems (at a variety of price points), finding things that they did and didn't like along the way. 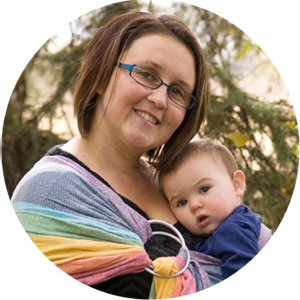 Finally, in November of 2009, on a rainy day in Vancouver, Christie and Trey were finally able to get the gears going and launch their own product line of diapers. 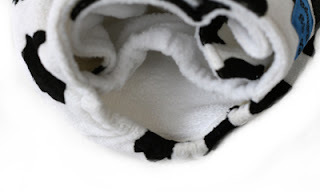 Today, the online Comfy Rumps shop stocks a variety of solid, printed, and fuzzy minky pocket diapers, along with whole diaper packages, pail liners, wet bags, detergents, and other accessories. Up for review, Christie and Trey offered to send me a pocket diaper of my own choice. Since many diapers I've selected so far have been very practical in their look, I decided to go for something a little more funky this time, and I picked their "Animal Printed Fuzzy Wuzzy" pocket dipe in the Cow Print (there are also 4 other very cute animal print diapers in their shop, if that's up your alley!). This diaper is constructed with a fuzzy minky outer shell (lined in PUL) and has a SUPER, SUPER soft microfleece on the inside (seriously some of the softest I've felt!). Each diaper also comes with 1 microfibre insert which will absorb approximately 1 cup of liquid in total. I was very excited to get this cute diaper on Baby Aurelia! The first thing I noticed when fastening it was the snap pattern. I absolutely LOVE the snaps on these Comfy Rumps diapers. They are similar to Dinkledooz or Hipkiddo snaps, for those of you who have seen similar patterns elsewhere. In fact, this is my favorite snap pattern out of all the styles of snaps out there; there are two top snaps on either side plus a hip snap on either side, and there is full cross-over capacity with the stretchy tabs. So, overall, this diaper provides a great, leakless fit, whether your baby has skinny or chunky thighs or a skinny or bulging belly! As this is a one-size diaper, there are also three rows of rise snaps to adjust for small, medium, and large rises. I loved how customizable the fit was! This diaper is a little bulky when worn, but part of that I attribute to the minky shell, which is extra soft and fluffy. At our house, this was a favorite diaper to wear pantless anyways, because it's so darn cute. Aurelia often modeled it with a white t-shirt and black socks (and a cute hair clip, of course), especially nowadays as the weather is getting warmer both inside and out! The one concern worth mentioning is one I've had before with other pocket diapers that do not stuff with an envelope style (with a flap covering the insert). This pocket has a wide-open pocket (with no flap) which does provide for easy stuffing and insert removal. You may recognize that FuzziBunz diapers have a similar style opening. However, I notice that Fuzzibunz has a bit of a snugger lining and smaller inserts (which at times can be hard to stuff, actually) whereas these Comfy Rumps pockets have a looser lining and larger insert. I like that the looser lining can help fit your hand inside when stuffing, and I like that the larger insert provides more surface area for absorption. However, several times I caught a little piece of the liner or insert trailing out the back, and we did get wicking problems due to our own negligence. After I caught on to what was happening (usually after I had applied the diaper while distracted or half-asleep! ), I made sure to tuck everything in snugly, or even started rolling the loose bit of liner down overtop of the insert and making my own little envelope-style flap. 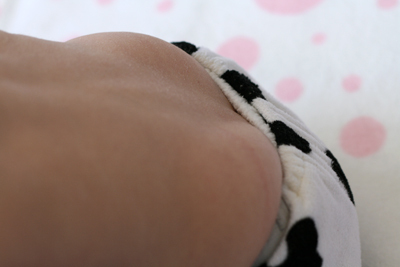 This was my one concern with these diapers and is something to watch out for when you first begin using them, especially if you like me, have been off the hook from checking the back with using more envelope-style pockets. Overall, this is a terrific fitting pocket diaper that is an absolute STEAL of a deal starting at $7.25 (regular solids) and running only as high as $8.00 (fancy minky prints). Also, although the actual product is made overseas, I do love that Comfy Rumps is a home-grown, family-run, Canadian business that I can help to support, and that provides quality, cute products to boot! 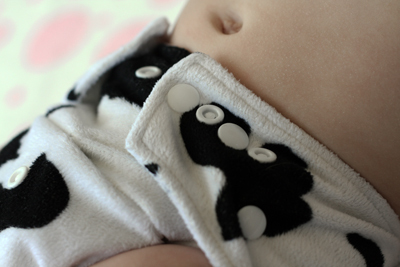 Head over to the Comfy Rumps website right now to buy a cute pocket diaper of your very own, starting at only $7.25! 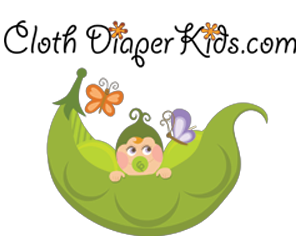 Mention your favorite two diapers from the Comfy Rumps website. Make a purchase from the Comfy Rumps website. Give yourself 2 entries for each item purchased & mention what you bought. Final details: I received no financial compensation for this review or giveaway, though I did receive the sample items free of charge. All opinions shared are my own, and I was not persuaded to share anything other than my own thoughts. Other users may have different experiences with this product than what I have shared. This giveaway will end on May 23, 2011 at 11:59pm MST and is open to residents of Canada and the United States only. Winner will be chosen randomly using random.org’s services. The winner will be contacted by email and will have 48 hours to reply before a new winner is chosen. The prize will be supplied and mailed out to the winner by the sponsor of this giveaway. I joined Comfy Rumps on facebook. Hubby loves the Cow print Fuzzy Wuzzy Animal print. Daughter loves the Leopard print Fuzzy Wuzzy animal print. I like the fuzzy wuzzy leopard & zebra prints best. I bought a 15 diapers from their website last week--does that count? (Took advantage of their May deal & got three more diapers, a wet bag & three more soakers. I'll be sharing the love with my sister and a couple of expecting friends.) Would've waited if I'd known about your review (and the extra deal--would've loved five more soakers). I like the zebra print fuzzy wuzzy and orange fuzzy wuzzy. I like cloth diaper contest and giveaways on facebook as Bobbie Ann. I love the Cow & Zebra Print Fuzzy Wuzzy diapers. 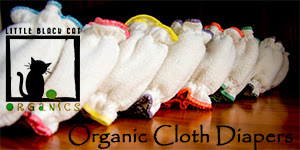 Like Cloth Diaper Contests & Giveaways on FB. Joined Comfy Rumps on FB. Like Everything Cloth on FB. I purchased the Plain Red Diaper. 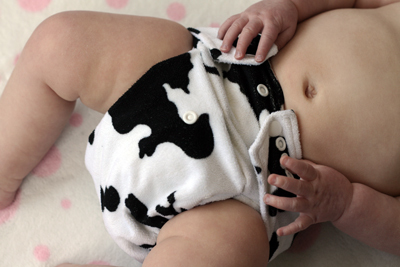 I also purchased the Cow Print Fuzzy Wuzzy diaper from the store site! I joined the Comfy Rumps groups on Facebook! I also purchased the plain Red diaper from the store site! My favorite two dipes are the Cow Print Fuzzy Wuzzy and the Giraffe print fuzzy Wuzzy. The prints are so cute and look so soft and cuddly! 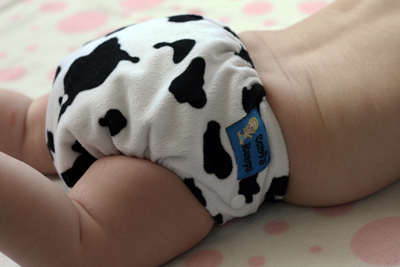 My favorite two diapers are the cow print fuzzy wuzzy and the giraffe print fuzzy wuzzy. I follow Everything Cloth blog via gfc! I like the blue fuzzy wuzzy & the zebra fuzzy wuzzy! My 2 fave Comfy Rumps diapers are orange and fuzzy wuzzy leopard! After visiting the Comfy Rumps website I think I would really love to try the Army Printer Diaper and the Giraffe Print Diaper! :) They are adorable and look so soft! I subscribe to the CDC&G email newsletter! I voted for you on the picket fence blogs! 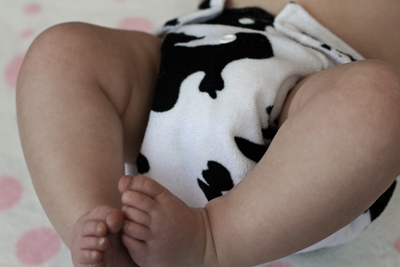 I love the cow print fuzzy diaper and the cow print wetbag! my favorite two diapers from comfy rumps would have to be the black solid one and the white one. I follow everything cloth with google friend connect. My name is Pamela M.
I tweeted about this contest and tagged @CDcontests and @comfyrumps. I follow you CDCG with google! I love fuzzy wuzzy cow and zebra!! My 2 favorite CD from CR are Minky pink and minky white. 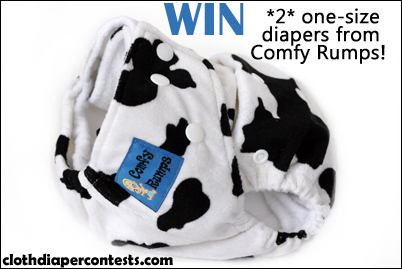 I like Cloth Diaper Contests & Giveaways on Facebook.